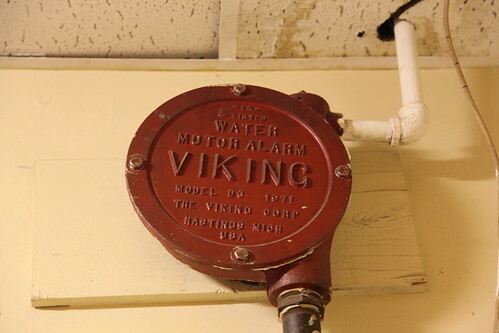 Built by the Viking Corp. of Hastings, Michigan, a water motor alarm like this both actuated and powered by the water in a wet sprinkler system. When water flows past the automatic sprinkler's check valve, it will then pass through this water motor alarm before flowing to the sprinklers. The water flowing through the system causes a rotating striker to hit the gong, producing the alarm sound.